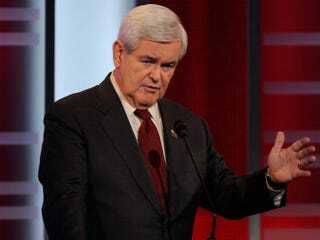 New York Times columnist Charles M. Blow writes that until the GOP Florida debate, Newt Gingrich had been able to hide his eccentricities. But they were on full frontal display when he suggested that America take on China in the space race by setting up lunar colonies. Anyone who remembers him from his days as speaker of the House in the ’90s remembers how erratic, unpredictable and off-the-wall he could be, but, so far, this campaign season he has managed to conceal his many absurdities and eccentricities. Furthermore, many Republican primary voters seem willing to forgive and forget his past. Others seem not even to remember it. He has been able to pass himself off as a wise elder statesman — a historian without a history — able to capture the anger and anxiety of the right and articulate it with force, lucidity and gravitas. Oh, it is to laugh! That is if you’re on the left. But for those on the right with firsthand knowledge of working with Gingrich when he was in Washington, this is a nightmare scenario. The outside possibility that Gingrich could win the nomination and wreck the party scares them to death. Their panic over this has reached a fever pitch. And this is not without merit. Read Charles M. Blow's entire column at the New York Times.